We’re doing fund raising. We’ve made it to 7 months! We began our blog during the ashy days of the great wildfires here in San Diego and became a quick and insightful critic of how the establishment fought those fires. We’ve become the best progressive political blog in San Diego. We receive hundreds of hits daily, thousands weekly. People hit us from all over the country and the globe. We want to continue to perform this kind of journalism – grassroots, raw, political, no-holds bar, and bring you these kind of reports. And now you can show us your support. We have just recently listed dozens of the original OB Rags that are available from us for donations. If you have had any pleasure from reading our posts, now is the time to grab up these old copies – some only have one copy left – and let us know that you’re with us. Go here to peruse these great issues. Look at some of these great covers! J: Thanks so much, Frank & Patty. D: Hi Frank and Patty, This is a great idea. I will check my Ragfile (in a box upstairs . . .in the scary attic) and see which ones I don’t have . . . any of those that you have I will buy. I’ll also see if there are any others I might like to have to give away . . . in any case some sort of donation will follow . . And you do have a great blog . . . the only one I look at because it is there, as opposed to getting linked to. I love the OB coverage . . . 28 years away now and it still feels like part of my own personal home turf. MK: OK Frank, I wish to “buy” all of the “only one copy left” editions — and figure out a permanent way to archive them to make them accessible to everybody. B: Thanks, and keep up the good work. MS: Dude, I’ve got this 3 times so far. How many times did you mean to send it out? 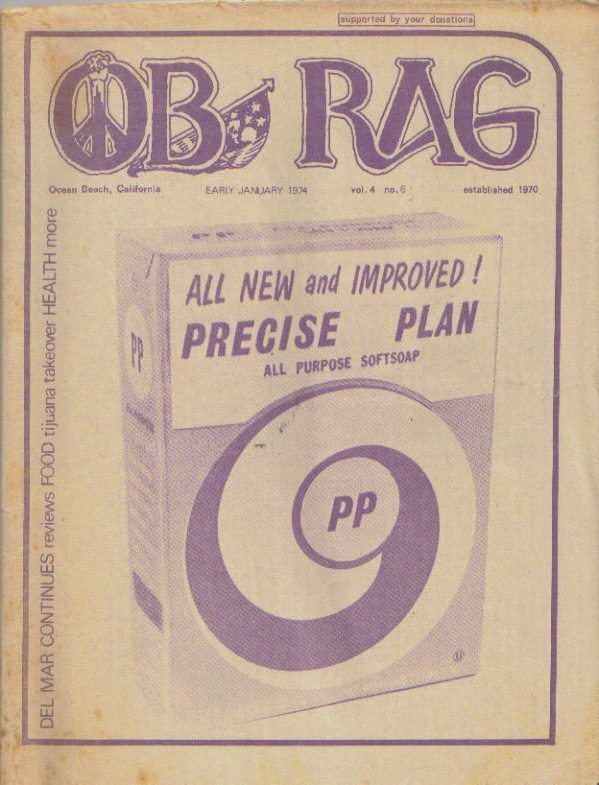 T: i’d love to get a copy or two of the ob rag. where do i donate? how much? the ob rag blog is the bomb! BV: Don’t you think it would be a good idea to include your blog address in your email? UD: It might also be of archival interest to store PDF image files of original OB Rags either online or for “sale” as well.
. . . . . And you do have a great blog . . . the only one I look at because it is there, as opposed to getting linked to. I love the OB coverage . . . 28 years away now and it still feels like part of my own personal home turf. . . .
and the idea of digital archiving of the Rag is very exciting. Kudos to those who are willing to takeit on. . . . and don’t forget the idea of an actual printed picture book featuring the OB Rag as the focal point of the social/cultural/political happening of the time . .. I still want to do that! !